The Tramper camper: pulled from a spot in Delaware and rebuilt by friends: now runs on solar and a bit of propane, an amazingly efficient home away from home! 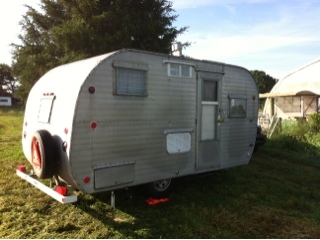 David and Jane Grant lived and traveled across the country for 6 months in this camper. All system were rebuilt, and now include jacks that power anything you can plug into a cigarette lighter: phones, computers, music, lights, movies: all powered by the sun! The large solar panel on the roof and the energy efficient light fixtures...even a fan that moves where you are, clipping on! A shower, stove, fridge, bed, dinette set...there is even an awning that can be set over the door! It will stay here in between sojourns with David and Jane. With insulated shades for the windows and layers of insulation in the walls, David and Jane were comfortable in high elevation Colorado winter and desert heat of summer in California. Should do just fine for guests here on the farm!